Photo credit: Todd Eddy. Shared under a Creative Commons license. Click for more info. Editor’s Note: This is a guest post from Iara Vidal, a Ph.D. student based in Brazil whose work focuses on altmetrics and scholarly communication. If you’re curious about altmetrics, or how they may be relevant to science communication, read on. Being overwhelmed by information is not a new phenomenon, but it is a very real problem. We struggle to keep up to date with all the discoveries, papers, and books in our fields of interest. It often seems as though new fields of study, methods, and/or tools are created every month. Buzzwords are all around, and it can be hard to know if there’s anything useful behind the buzz. One of these buzzwords is altmetrics. Twitter is a fantastic place to share research, express opinions, and connect with others in the same field of research. This week on Twitter, I came across an image that was a hybrid between a science poster and an infographic. 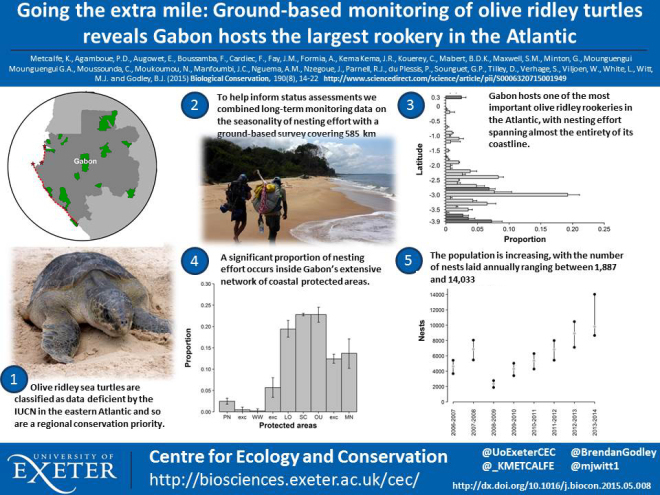 In four bullet points, a few photos and a couple of graphs, this ‘tweetable poster’, which is also known as a ‘graphical abstract’, revealed that scientists who had combined long-term monitoring data on the seasonality of nesting effort with a ground-based survey covering 585 km, had discovered that Gabon hosts the largest rookery of olive ridley turtles (Lepidochelys olivacea) in the Atlantic and that a significant proportion of nesting effort occurs inside Gabon’s extensive network of coastal protected areas. Live-tweeting, whether a department seminar or a conference talk, is one of the most powerful aspects of academic Twitter I’ve witnessed. It’s not an easy skill, but it’s worth cultivating, because it has tremendous value in bringing exciting research to a broad audience. Instead of the twenty to two hundred people in the room, you have the potential to reach thousands, and generate exciting conversations — what I often refer to as the “meeting within the meeting” that only takes place in the ether. Discussion long overdue apparently. Nice comments! When Susie Maidment presented her in-progress research at SVP in Berlin last week, someone came in late, missed her “no tweeting, please” request, and posted a screenshot of the new work (since deleted). On the back of that, Susie started an interesting thread in which it became apparent that people have very different assumptions. She, and Marc Jones, and others, were assuming that if you don’t tell people not to tweet, then they’ll know not to. Meanwhile, I, and Björn Brembs, and others were assuming the opposite: unless someone says not to tweet, you’re good to go. Obviously this state of affairs is a recipe for disaster. We’re all going to find ourselves giving presentations where we assume the audience will be doing one thing, but at least some audience members are assuming the other. Not sure if you want to blog? Easy, just join The Conversation. Guest blogging and go-for-it blogging. There are many many many blog spaces for professionals to ‘guest’ blog but you often have to be ‘invited’ by the editor of big well-established journal, perhaps once you’ve been blogging for a while you might be asked to contribute but until then… This is where The Conversation comes up trumps for you: The Conversation is a website written by professionals like you for the public audience. You write and send in your piece and professional perspective on current world topics. These news-style pieces are edited and published with clear indication of the author and their affiliations. The Conversation is an excellent webspace that is gaining momentum and respect and I would recommend proposing a piece about something you are passionate about in your field/subject, there are many to choose from (see lower purple line in picture below), and then click to ‘become an author’ (upper purple arrow) .